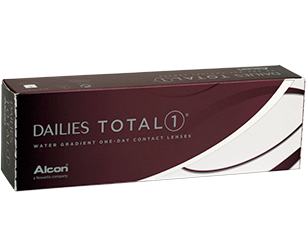 Dailies Total 1 lenses offer the convenience and comfort of single use lenses at exceptional value. These lenses benefit from handling tint and revolutionary water gradient silicone hydrogel material. This advanced material allows extra oxygen to the eye making the lenses comfortable throughout the day and healthy to wear. €58 per month (30 pairs) by direct debit. (Alternative quantities available. Minimum purchase 3 months.) Available exclusively in-store.